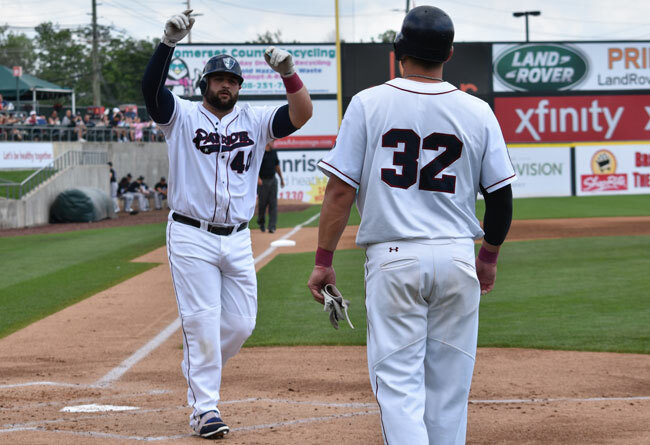 (Bridgewater, N.J., Jan. 29, 2018) - The Somerset Patriots have re-signed 2017 Atlantic League Post-Season All-Star Kyle Roller for the 2018 season. Roller is the first announced signing for this year’s roster. Roller enters his third season with the Somerset Patriots and in the Atlantic League of Professional Baseball. Previously, he spent the first six seasons of his career with the New York Yankees organization before playing the first half of 2016 with the Tampa Bay Rays organization. Despite playing in only 90 games during the 2017 regular season, Roller led the Atlantic League in slugging percentage (.591), on-base percentage (.429) and OPS (1.020). The next closest player in slugging (Alonzo Harris, York) finished 61 points lower than Roller, while the next closest in on-base percentage (James Skelton, New Britain) finished 21 points lower. Additionally, the former East Carolina University standout finished third in the league in batting (.326), sixth in home runs (22), tied-sixth in RBI (77) and tied-eighth in walks (55). Roller’s 61 runs scored were tied for the team-lead while his 102 hits ranked third on the team. Roller went 5-for-5 from the plate in a historic performance on June 28th against Southern Maryland. That night, he hit two home runs and became just the second Somerset Patriot ever to record a cycle (Orlando Miller, 2002). In addition, became the fourth Patriot all-time to tally eight RBI in a single game, tying the franchise record with Ryan Radmanovich (2008), Emiliano Escandon (2003) and Greg Blosser (2001). Roller notched a number of notable streaks during the season, including a 10-game stretch from June 25th through July 5th in which he went 18-for-36 (.500) with five home runs and 20 RBI. Roller also had a six-game stretch from July 29th through August 4th where he hit three home runs with nine RBI and a four-game stretch from September 3rd through September 7th in which he went 7-for-16 (.438) with three home runs, four runs scored and 10 RBI. The North Carolina native played in 52 games with Somerset in 2016 after joining the team in June. That year, he hit for a .284 batting average with 10 home runs and 40 RBI. Roller reached base at a .401 clip while serving as the Patriots primary first baseman/designated hitter. Over his eight-year career, Roller holds a .272 career batting average with 133 home runs and 504 runs batted in over 862 career games.